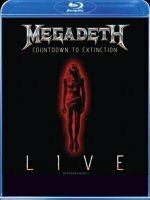 Can it really be twenty one years since 'Countdown To Extinction' came out? It seems only a few years ago I was listening to it on tape in my friend's dining room! 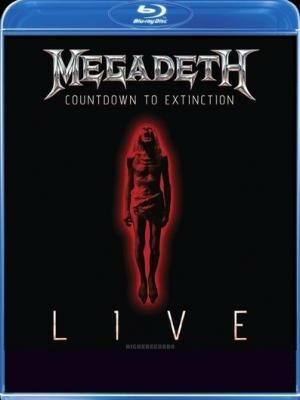 To celebrate the twentieth anniversary of what is widely regarded as their best and most successful album, Megadeth embarked on a commemorative tour including one night at LA's Fox Theatre which was recorded and has now been released as a DVD/CD. Although this is packaged like a CD, I got more out of the DVD and therefore I'm reviewing it as such; that's not to say the audio side is awful. When compared to other live audio releases I've heard, this may not be the best but it's certainly not the worst. The recording itself is fairly clean and clear sounding but I do think Dave Mustaine would have benefited from being lifted higher in the mix as he occasionally gets buried under the guitar. The audio version is a good warm up but the best way to enjoy this is to watch it. Visually the DVD is beautifully shot with some lovely angles; it's not quite the in your face perspective of 'Maiden England' but uses wider, more technically choice shots that focus on the larger picture (which is a wise idea given Mustaine's out of control perm). The vocal clarity is better than the album and leads to a far greater entertainment experience. I am reliably informed that Mustaine's vocals are better than has been heard previously in the flesh live, particularly on the DVD. I felt the band were a touch static at times, especially Mustaine, which reinforces the feeling that he's always been a reluctant front-man. That aside, there can be no argument about the quality of his axe work and whilst his vocals may not be the greatest he remains a unique sounding vocalist. The main knock is that it doesn't quite portray the atmosphere of what I am sure was a great evening; at times it's exceedingly lively and raucous but at others it feels like everyone simply settled down for a nostalgia trip. It's probably one of those "had to be there" moments. As far as song selection, the performance opens with three none 'Countdown...' entries including 'Trust' and the sensational 'Hangar 18'. Megadeth then motors through 'Countdown...' with my personal highlights being the wonderfully cold 'Symphony Of Destruction', the maniacal 'Sweating Bullets' and the awesome title track. With the album covered, Megadeth closes out the show using three more extra tracks with 'Peace Sells' and 'Holy Wars' being amongst the top moments of the show. Despite thoroughly enjoying this, I'll be the first to admit that neither part is a barnstormer and this release may not hold massive interest for passing Megadeth fans or general Fireworks & Rocktopia readers. But for genuine Megadeth enthusiasts (especially those that were there first time around) and fans of the individual album, this is pretty much a must own due to its nostalgic nature.